Day 7: After our success finding the last 2 unmapped mountain roads, we were eager to try our luck again and continue searching. We had good spots scoped out, but there were too many promising squiggles on the map to not check out. Unfortunately for us, our luck didn’t seem to be as good this day. We drove up squiggle after squiggle for several hours, not finding anything exciting. We were looking for the gems only so anything less than “hella dank” never got skated. I was getting tired of driving so when we came across a beautiful graveyard on a steep hill with nice bends, I couldn’t pass up a photo shoot. The pavement was slidy yet predictable and made for a fun free ride session with Nori behind the lens. After the well needed break we hopped back on the highway to continue the relentless search for new squiggles. As we neared dark, we found it, our money road. On our way up we decided the bad pavement was worth enduring because the road was so good. The perfect mix of hairpins, kinks, steepness, and scenery was too good to pass up. When we got to the top however, Nori exclaimed “Oh, I know this spot!” The backside was even better looking than the front. 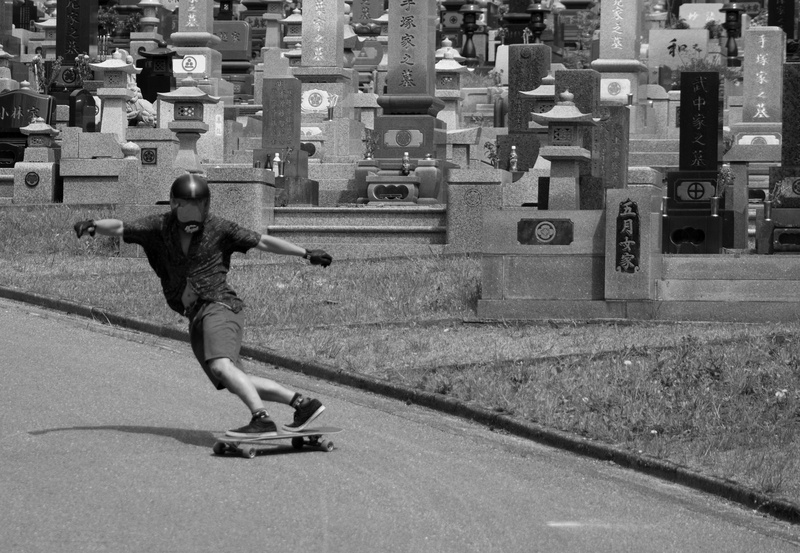 Nori had skated it when Patrick Switzer was in Japan said it was dank! The top section was super sharp and technical with blacktop pave, then it opened into a faster even MORE technical section with pot holes, cracks, and drainage grates in the slide zones. We hit one practice run before it got too dark and confirmed that yes, it was indeed “hella dank.” We set up camp on a view point near the top and as we ate curry around the fire, went over our plan for dawn patrol follow runs on this beast. Five am, birds chirping, coffee consumed, camera on car... go time. We were still refining our radio system at this point, and working through the kinks was taking up precious time. Not only that, we were having technical difficulties with the radios themselves and communication wasn’t smooth. We got in one practice follow car run at a safer distance, and were about to drop in for the real deal when from behind comes a dorky, hearse looking Japanese police car. Out of the 3 people that drove past Nori at the bottom, one of them phoned the police. Terrible luck! We weren’t hard to spot with the camera taped to the car hood and my board in hand ready to drop. It was only 40 minutes away and there was a famous temple directly on route so we stopped in to play typical tourist. It was Clayton and I’s first real Japanese temple and we were fascinated by the immense attention to detail these uber old buildings had. The gate of the main temple had hundreds of dragon heads poking out the front, each with many colors of paint and metal detailing. There was a sense of appreciation while walking through these structures as you acknowledged what went into them. 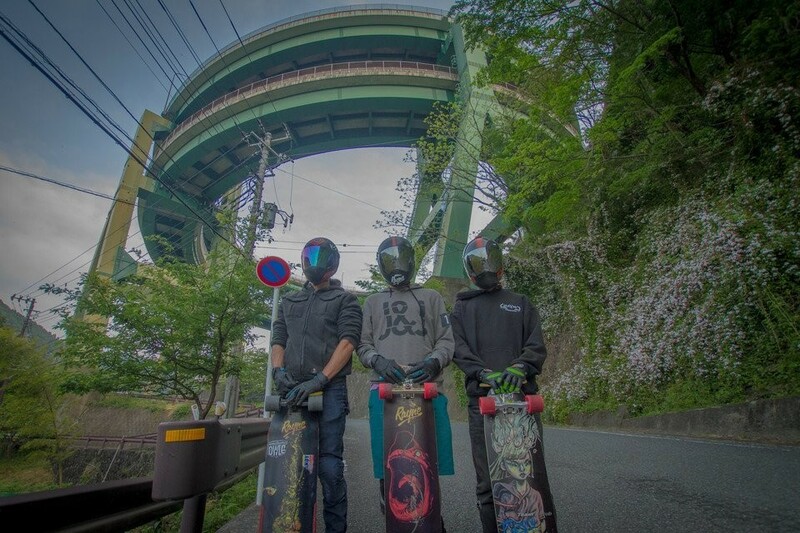 As cool as it was, we had hills to skate and a full tourist day in Kyoto ahead so we didn’t hang out long. We started our ascent up the one way uphill section of Irohazaka on route to the one way downhill. This spot is popular for tourists and speed freaks alike. At the top is an epic view with a cable car going up even further, and a rest area full of leathered up bikers and fast cars. Being a one way loop makes it an enticing race track and almost every corner is lit up with skid marks. The anime series “Initial D” about car drifting helped make this spot popular for drifters. It was by now mid day and I knew it would be super heat to skate, let alone get a big enough gap in traffic. Normally we would camp out and do dawn patrol runs but on this hill, that’s the game plan of the local vehicular maniacs. Deciding I’d rather deal with senior tourists than sideways Toyota AE86’s, I dropped in for a blind raw run. By the 8th corner my legs were starting to burn but there was still 19 corners left! Knowing I wouldn’t get a second run without a visit from the coppers, I pushed through the burn. Halfway down I had to pass an old lady going 40km/h. A few more corners and I may have fallen off my board! With the follow run in the bag we took the heat score camera off the hood and drove back to the top to get Nori and Clayton a run. It’s pretty disorienting when you’ve been down so many hairpins you have no clue how many you’ve done or how many are still to come. It’s almost comical and all you can do is chuckle to yourself and keep cornering. The boys took a few bails, but made it down alive and cop free. Another legendary road checked off the list, now it was time for another famous drifting spot. Mt. Haruna is another Initial D stomping ground, made especially apparent by the volume of anti-drift and speed installments on the road. One stack of hairpins had continuous “whoops” from corner to corner that stopped you from exceeding about 60/km/h without catching air. Despite grooved pavement and aggregate painted lines there was still skid marks all over the road. 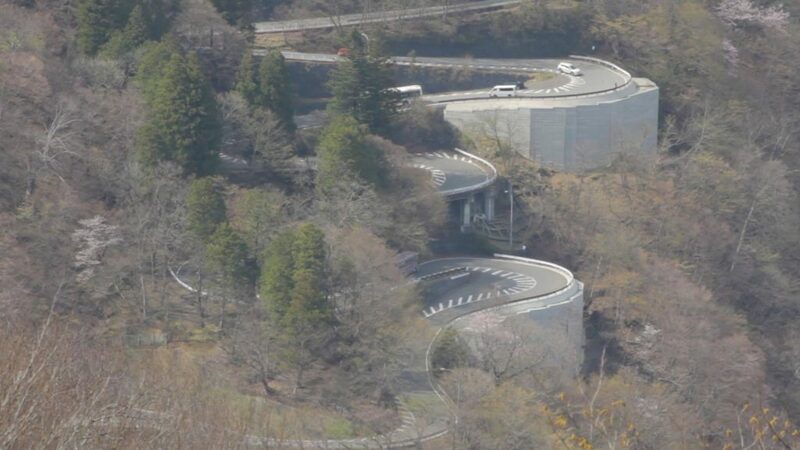 At the top we were surprised by the weirdest and most Japanese road feature I’ve ever come across. We noticed a song playing, similar to “Itsy Bitsy Spider,” and realized it was being played by the road! Built into the pavement was a series of rumble strips that played a song as your tires drove over them. So awesome, so weird! Immediately after the song, we hung a left onto a narrow mountain road that we had mapped out. The road immediately dropped into steep, chunky corners that each had their own grade sign. Ten percent, 12%, 14%, this road was gnarly! Super long too, but we had one more road to scope before dark. The parallel road was just as steep and even had one corner labeled 20% grade! Not only that, the pavement was much much better. We decided this was our run, and went through our now smooth plan of controlling traffic to skate safely the next morning. 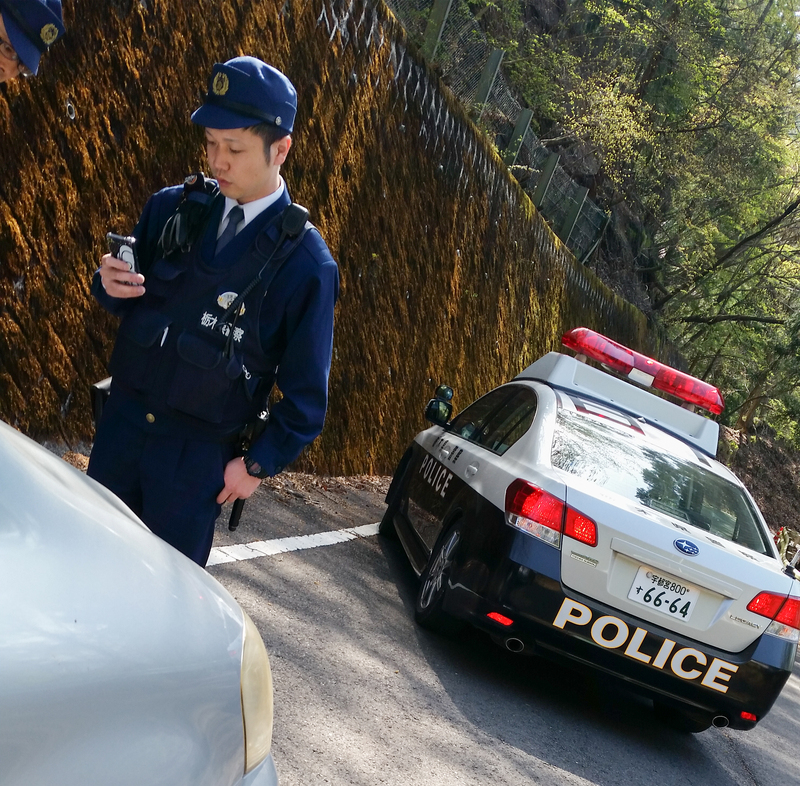 In Japan, you need radios on the one lane roads. Besides being so narrow, they’re very blind, usually lined with trees. Plus, locals drive fast and don’t stick lanes. This run was also super long but due to our radio range and a few other roads turning on, we only skated a small section. Fine with me because one section was 14% through of bunch of sweepers you didn’t need to slide. A recipe for 120km/h and brick squad central. Maybe another day! We got our runs in just in time because it started to rain. Bad timing for our new friend about to show up. Junichi drove out to meet up with us and skate on his day off. Clayton knew him from when he came to Canada to skate a few years back so the old friends reunited, and introduced us to each other. We weren’t about to let him drive hours for nothing. Besides, Clayton and I are from Raincouver so we slapped on rain wheels and got a session going! The steep corners made for a really fun time in the wet and a good challenge. We were all smiles but soaked and cold so luckily for us, there was an onsen on top of the volcano for us to warm up. This was one of the fancier onsen we went to. In the lounge room they had massage machines for your feet, hands, and full body. The hand massage machine was humorously named “Happy Time” and it did indeed make us happy. Right next to the machines was a beer vending machine where Clayton and I plunked in 300 yen for some tall boy cans of cold refreshness. 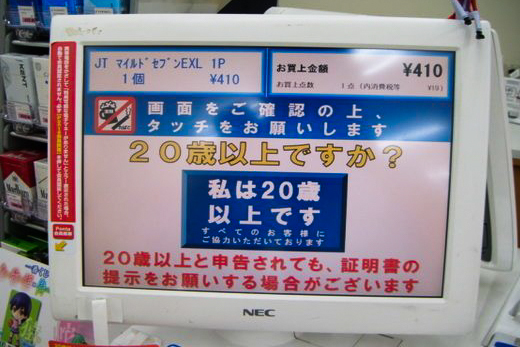 The drinking age in Japan is 20, but the honor system failed to keep 19 year old Clayton from purchasing, AHA! Funny side note, the way to confirm you're old enough to buy booze at convenience stores is to press a button on a screen saying "Yes, I'm over 18." I guess they do better with the honor system in Japan, haha. Are you legal drinking age? "Yes." "Why yes you are!" After well needed showers and a steaming onsen we wrestled ourselves back into the rain to set up our camp. Junichi works for a camping gear company and is absolutely loaded with the good stuff. He pulled out his big rain shelter and alcohol powered stove for us to cook dinner and stay dry. It’s always a scramble to set up camp in the rain so luckily my hammock sets up super fast. The next day was more rain and we had 9 hours of driving to get to our next destination, Kyoto. It's one of the biggest cities that didn’t get bombed in WW2 so it’s treasures are still intact. 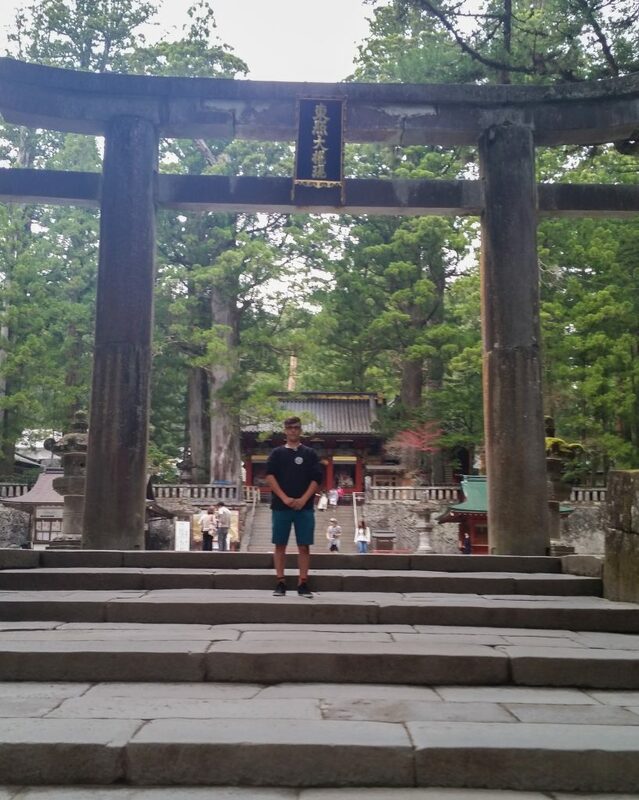 I’ve always wanted to check out the ancient temples and traditional culture and I was finally headed there! Before the car trip we figured out another cheap road trip food trick. “Onigiri” are Japanese rice balls, usually with something inside and wrapped in a piece of seaweed. We cooked up a large batch of rice, bought some fish and sauce, and batch processed enough onigiri for days. Cheap and delicious! The next blog post is the most action packed yet.